By Tim Royner: Heavyweights Joe Joyce and Daniel Dubois have been ordered by the BBBofC to start negotiations for a clash for the vacant British heavyweight title. A purse bid has been scheduled for next month on April 10. The magical question is will the promoters for both fighters agree to setup the fight. This would be a massive fight if it took place, but it’s very unlikely that it’ll take place. The BBBofC is doing Dubois no favors in ordering him to fight a punching machine like Joyce. This fight would be a really bad idea for Dubois. 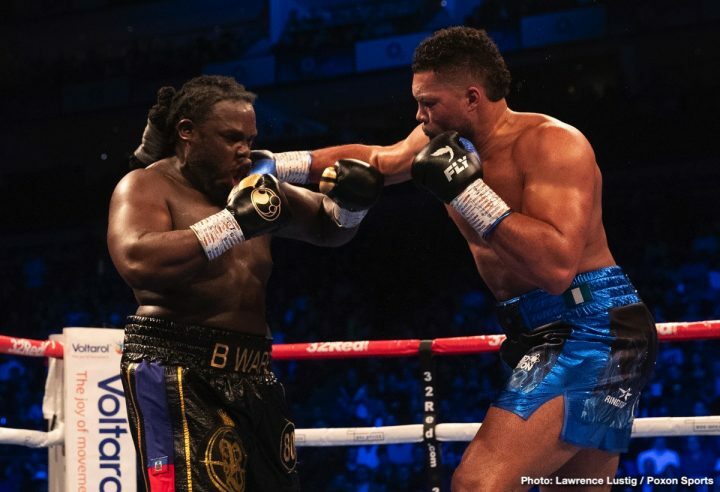 Joyce has Olympic experience, and he’s coming off a brilliant performance in stopping former World Boxing Council heavyweight world champion Bermane Stiverne in the sixth round last February. The way that Joyce is fighting now, he might be the best contender in the division. Joyce’s size, power, fast pace style, and his versatility makes him a threat to any of the contenders. Dubois might be over-matched by Joyce, who is drawing comparisons to a young George Foreman. Most boxing fans would assume that it’ll be Dubois’ management that will choose not to make it happen due to the high risk involved. Joyce is looking very good since he turned pro in 2017, and he soon be challenging for a world title. Dubois might be little more than a big speed bump for Joyce, who would force him into a fast paced brawl that would likely tire out the youngster. 2016 Olympic super heavyweight silver medalist Joyce (8-0, 8 KOs) looks to be the more complete of the two heavyweights, and the one that would be seen as the favorite if this clash takes place. Dubois is still very raw at 21, and he didn’t look at all impressive recently in beating former heavyweight world title challenger Kevin ‘Kingpin’ Johnson by a 10 round points decision last October. Joyce is well past the British level at this point in his career. Other than fame that Joyce would be receiving by destroying a good prospect in Dubois, the fight does nothing for him. Joyce, 34, is beyond fighting for the British title at this point. Due to Joyce’s late start as a pro, his promoters at Ringstar Sports are hurrying him along with his career in order to get him a quick title shot before he starts aging out and deteriorating. Joyce, 33, is the same age as World Boxing Council heavyweight champion Deontay Wilder, who has been a pro for 11 years. Joyce has only been fighting in the pro ranks for two years. As such, Joyce obviously can’t afford to get stuck fighting at the British level for the next three to five years before he gets a title shot against Wilder or Anthony Joshua. It’s now or never for Joyce. In contrast, the 21-year-old Dubois has seven years to mature before he’s ready to go after the world titles when he’s around 28. By then, Joshua will likely be at the end of his prime, and ready to be taken by him.